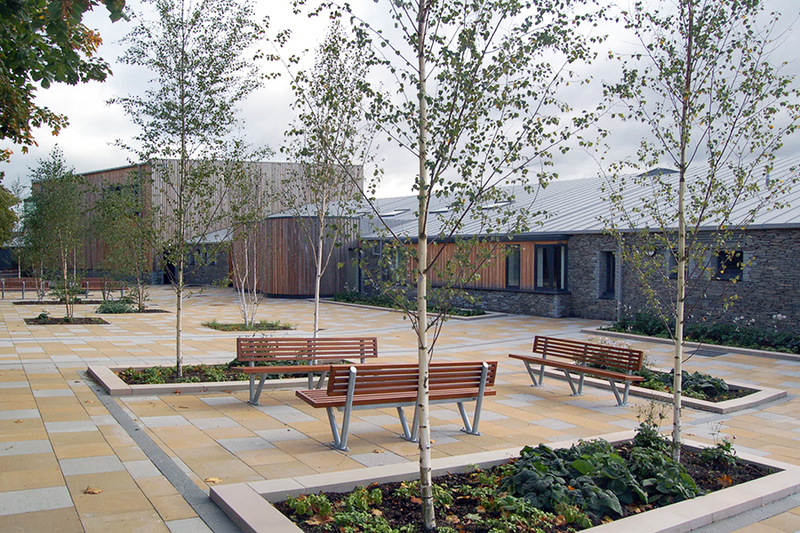 As part of the Scottish Borders Council Framework Agreement, Fairhurst was commissioned to provide full Landscape Architectural services for a new primary school in West Linton. This educational facility is a 14 classroom primary school with additional nursery and recreational grounds that facilitate learning and outdoor activity. Fairhurst was instructed to provide a full range of services, from initial site investigation, survey and conceptual sketch design through to the preparation of landscape proposal plans to form part of the planning submission. Following planning approval, Fairhurst progressed with design proposals through to construction, including contract administration for the scheme. The landscape was designed with careful consideration to the surrounding environment and rural context of the Scottish Borders. The design concept was formed by echoing the local character of West Linton, creating a discovery trail within the school. The use of native pine and birch groves within the school created a distinctive design, highly influenced by the school’s surroundings. The design also responds to the aspirations and requirements of the school, creating a varied network of spaces that encourage different types of learning experiences. These included a school orchard, kitchen garden allotments, a wildlife trail, wildflower meadow and mounded play.